£5 Off Food Bill with Sign-up at Sizzling Pubs Get £5 off your next food bill by simply signing up to the mailing list at Sizzling Pubs. Don't miss this discount! Kids Eat for £1 at Sizzling Pubs Feed your little ones for less when you dine at Sizzling Pubs! 2 Meals from £8 Monday-Friday at Sizzling Pubs Every weekday grab a bite for less at Sizzling Pubs! Enjoy 2 meals from just £8 with this deal! Free Drink with App Downloads at Sizzling Pubs Download the app for a free drink at Sizzling Pubs! Easter Menu Available at Sizzling Pubs Sizzle this Easter with big deals and offers from Sizzling Pubs! Unlimited Cooked & Continental Breakfast for £2.99 at Sizzling Pubs Dine like a king today at Sizzling Pubs, where breakfasts are unlimited! 8oz Sirloin Steak for £7.99 on Wednesdays at Sizzling Pubs Get your steak on with Sizzling Pubs, enjoy from just £7.99! 2 Courses from £4.79 Mon-Fri with Golden Years Menu at Sizzling Pubs Valid Monday-Friday, 12-5pm. Make the most of lunch with the Golden Years menu, perfect for smaller appetites at Sizzling Pubs! Free Soft Drink with Any Burger Orders at Sizzling Pubs If your burger brings on a great thirst, no worries, grab your free drink at Sizzling Pubs! Chip Shop Friday - Chip Shop Meal & Soft Drink from £7.49 at Sizzling Pubs Feast your eyes on great deals at Sizzling Pubs! Two Cocktails for £6 at Sizzling Pubs Why not treat yourself to an extra cocktail, with 2 from £6 you won't break the bank! Kids Main, Dessert & Drink from £4.99 at Sizzling Pubs Three courses from just £4.99, amazing deals and discounts from Sizzling Pubs! Free Soft Drink with Lunch Orders at Sizzling Pubs When you order lunch, don't miss out on a free soft drink! Burger & Drink from £5.29 at Sizzling Pubs Grab this classic combo from just £5.29 today at Sizzling Pubs! Gift Cards from £5 at Sizzling Pubs Get a super gift for a loved one at Sizzling Pubs! 2 G&T's from £5.50 at Sizzling Pubs Get your G&T for less at Sizzling Pubs! With over 200 restaurants across the UK it’s easy to find the Sizzling Pub nearest to you and there are lots of great offers to take advantage of when you make it your local eatery. Whatever your plans are from treating yourself to a hearty fry up at the weekend, watching the game with your mates or taking your parents out for a tasty Sunday Roast, you can rely on Sizzling Pubs to deliver exactly what you’re looking for and always at a great price. All Sizzling Pubs provide great quality food and offer an extensive menu of breakfast classics, pub favourites, Sunday Roasts and even ‘build your own’ kids’ meals, making it the perfect choice for a whole number of occasions. The prices are always low and with some fantastic deals combined with Sizzling Pubs offers helping you save money, there are plenty of reasons why you should visit a Sizzling Pub again and again. The wide range of food options and great selection of beverages available at your local Sizzling Pub means that even though you’ll be spoilt for choice you’ll still be guaranteed a fantastic time. How Do I Use My Sizzling Pubs Voucher? Chose the vouchercloud Sizzling Pubs discount voucher that you want to use and click on 'View Deal' to receive your code or voucher. Once you have clicked on the ‘View Deal’ icon you will be informed whether a voucher or code is needed. Print out your vouchercloud Sizzling Pubs discount voucher, or save it on your smartphone if you don't have access to a printer. Let the restaurant know that you'll be using a discount voucher when you arrive, this will make it easier for them to apply the discount to your meal before you pay the bill. 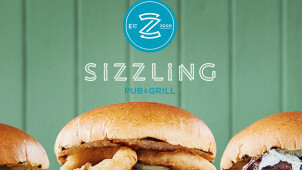 Get £5 off all food by signing up to become a Sizzling Pubs member. It’s really easy to do, just find your local pub on the website, click the ‘sign up’ icon and after you’ve filled in your details you’ll be presented with a link allowing you to download and print your discount voucher. What are the opening hours for my local Sizzling Pubs? Opening Hours may vary for each individual Sizzling Pub venue. To find opening hours specific to the Sizzling Pub you’re planning to visit, search for the pub on the ‘Find a Pub’ section of the website and click on the ‘Opening Hours’ icon. Do Sizzling Pubs offer Vegetarian and Gluten Free options? All meals that are suitable for Vegetarians are marked on the Sizzling Pubs menu with a (V). For information regarding Gluten Free meals please ask a member of staff for details or refer to the allergen guide available on the website. How do I access free Wi-Fi at Sizzling Pubs? It’s really easy to access the free Wi-Fi at Sizzling Pubs. First, you need to register your details unless you’ve already done this at another O2 Wi-Fi hotspot. Once you’ve signed up, your device will connect automatically every time you visit a Sizzling Pub. Where can I buy a Sizzling Pub gift card? Sizzling Pubs gift cards can be purchased online or from any of the restaurants. When purchasing a gift card online you can choose between a plastic gift card or an e-gift (the recipient receives an email or text message). You can search for and feedback to your specific pub here. You can find your local pub here to discover opening and closing times. If you’re looking for somewhere you can enjoy some great value for money meals in a relaxing environment, then look no further than Sizzling Pubs for a warm welcome. There’s a great selection of good honest pub grub available from gourmet burgers to sizzling steaks and you can enjoy some excellent money saving special offers on a delicious meal when you use a Sizzling Pubs voucher. Whether you’re planning on relaxing with a nice, chilled beverage whilst watching a match or treating the family to a meal out, you can count on Sizzling Pubs to satisfy all your needs. Sizzling Pubs are dedicated to supporting the community in whichever way they can and believe strongly in making savings for life savers. That’s why they offer anybody who is part of the armed forces or emergency services, plus their families, 10% off all food, every day. Sizzling Pubs are also helping to support the charity Help for Heroes by donating £1 from every bottle of Help the Heroes wine sold to the charity. Feeding the whole family is often a daily struggle especially if you’ve got a few fussy eaters but life just got a little bit easier with the Sizzling Pubs kids' offers. Head to your local Sizzling Pub and enjoy a fun family meal out without any of the hard work. Who said keeping everyone happy had to be a struggle? It isn't with Sizzling Pubs!